60% of the NYSE index listed stocks are bullish - unchanged. From one hand we see no changes in the long-term Breadth numbers on the S&P 500 (SPY) and DJI (DIA) indexes. However, at the same time, we witness strong drop in the number of the bullish stocks on the Nasdaq 100 index (QQQ). The overall number of the bullish stocks is at and above 60% on all major indexes and this is a signature of the long-term Bull market. The long-term market Breadth sentiment is bullish. However, strong decline in the number of the Bullish stocks in the technology sector is a sign of a coming correction on the Nasdaq 100 index. So far, the other market indexes are not showing similar signs of weakness. Even Russell 2000 index (Small Cap market Sector) remains stable. If this uncertainty in the technology stocks does not spread over the other market sectors, the odds are good, the same as before, this weakness in the technology sector will be isolated to this sector only. 290 of the S&P 500 index listed stocks are above 20-day MA - down by 25 from a week ago - weak Bullish Sentiment. 52 of the Nasdaq 100 listed index stocks are above 20-day MA - down by 18 from a week ago - weak Bullish Sentiment. 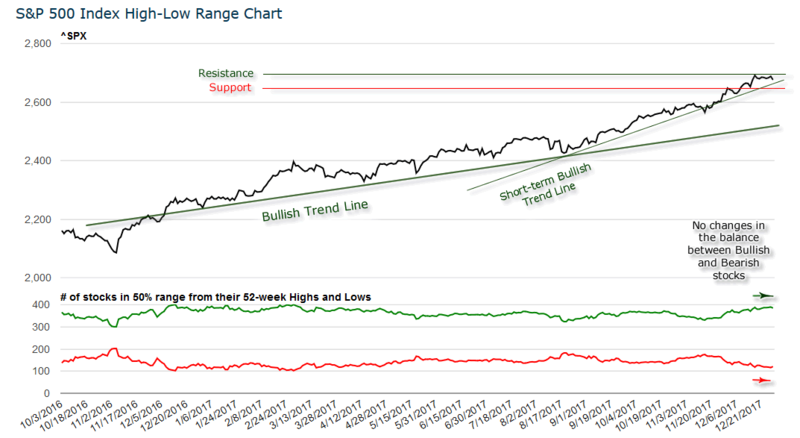 The 20-day short-term Breadth sentiment weakened and this is the third week in a row of the decline in the number of the Bullish stocks on the S&P 500 index. The overall number is still bullish - we still count more than 50% of the bullish stocks on all time-frames. However, consistent decline in the number of the bullish stocks point to the increasing odds of a correction. If a week we mentioned about that as a weak signal, now it became a strong weakness which should not be ignored. 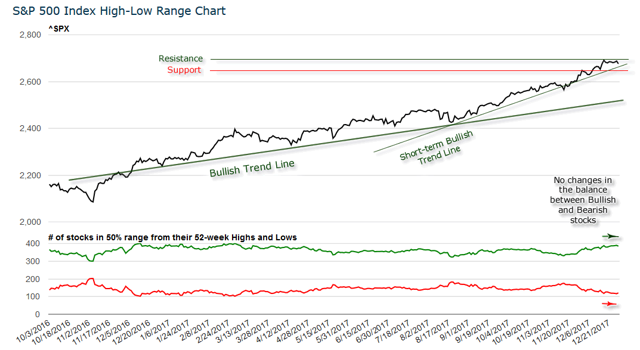 The Nasdaq 100 index joined the S&P 500 and now, the Breadth sentiment on both indexes dropped from strongly Bullish to weak Bullish. This suggest that the first week of 2018 will be bearish. 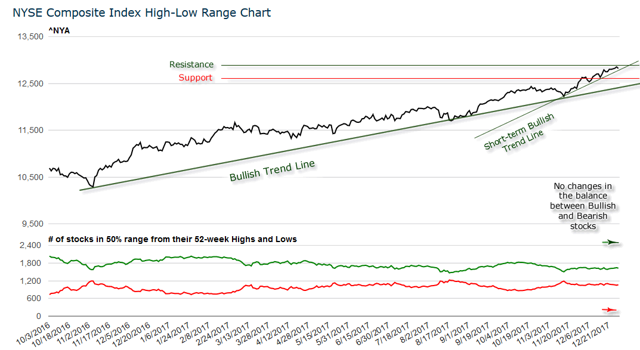 Short-term market Breadth sentiment for the coming week is Bearish. The Breadth numbers favor negative trading on the market for the next week. This is not a suggestion of a strong correction. We have low volatility market and mid- and long-term Breadth numbers remain strongly Bullish. 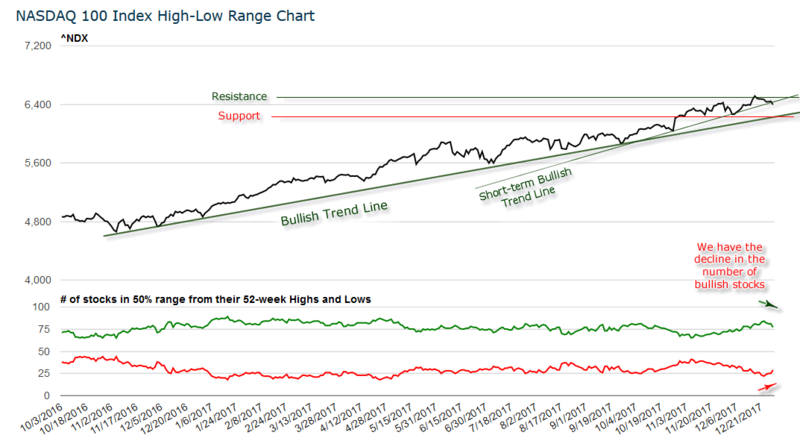 Therefore the Bearish short-term Breadth sentiment should be considered as a temporary weakness at this moment.